English Language Learners and International Support Preparatory Academy (ELLIS) is designed for new immigrants over the age of 16. Some know almost no English and have had little education in their home countries. Others have nearly completed high school in their home countries but need to perfect their English. The school is part of the Internationals Network, which has a long record of preparing new immigrants for college. Principal Norma Vega, formerly a social worker at Brooklyn International High School and principal of Bronx International High School, founded ELLIS in 2008. 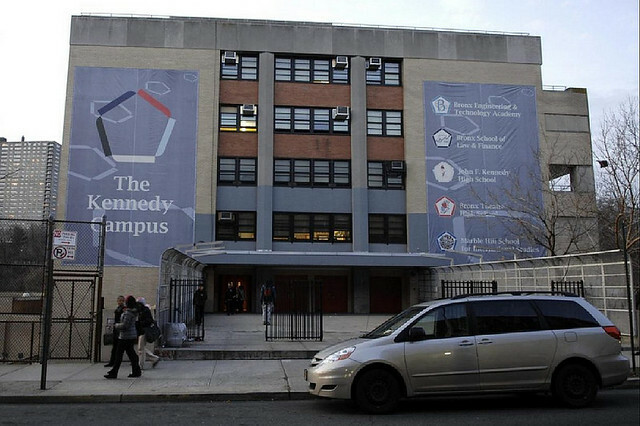 ELLIS shares the huge Kennedy Educational Complex with other small schools. Students must pass through metal detectors to enter the building. Attendance is below average.